In December, UK rapper J Hus was sentenced to 8 months behind bars for carrying an unconcealed weapon. But as of yesterday, the 22-year-old rapper is a free man - and he celebrated his unexpected return to civic life in unexpected fashion: by turning up next to Drake at the O2 Arena last night during his London concert-run. Evidently, J Hus only served about half of the commuted jail sentenced. "We're about to celebrate one of our brothers tonight", Drake addressed the crowd, just as the LED flooring lt up, displaying the words "welcome home." 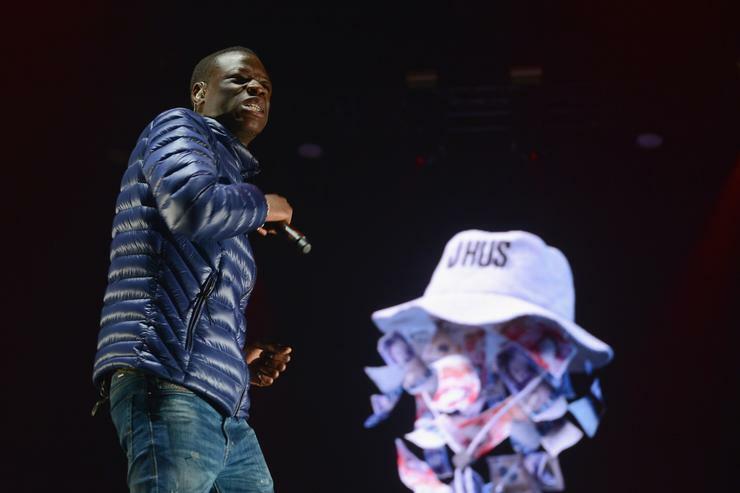 The confused crowd had about a second to catch its breath before J Hus appeared onstage, addressing both Drake and the crowd at large, in the same omniscient voice. "I've missed you so much, I swear I missed you so much," he exclaimed. "I waited for this all week so I could give you this stage so you can do exactly what you've been waiting to do," Drake replied in earnest, before yielding to his guest who performed his hit record "Did You See." After the show, J Hus and Drake rehashed the love fest on social media in two separate posts, both highlighting the "different energy" they felt during their get-up.